I’d originally planned to rush out my thoughts on Battlerite Royale the moment the servers closed. As I started to write, I realized I needed to think much more about the game and not only how it plays, but also what it means for Battlerite, and Stunlock Studios. I’m still not entirely comfortable with the separation of the titles, and to address the elephant in the room early, my playing of Battlerite Royale has left more questions than answers. There’s no mistaking that Battlerite Royale has all the makings of something truly special, and yet the same can still be said for Battlerite. Combined as a single product, with access to both within the same client, there’s no mistaking it could be a powerhouse coupling. If Stunlock Studios chose a path not too dissimilar to the approach Epic have taken with Save the World and Fornite, I’d likely be overjoyed (heck, most of the community would be). But to split one from the other feels entirely unnecessary, and irrespective of the legwork Stunlock undertake to juggle both, one will likely cannibalize the other: the studio has neither the resources or the manpower to make both products the best they can be. Here's a mock-up of what we think the first menu should be when you open Battlerite. Despite these misgivings, and as someone who has spent thousands of hours playing Battlerite, Battlerite Royale is great. Actually, it’s better than great: it’s bloody brilliant. There’s only so much you can do within an Arena setting, and unless Stunlock approached Battlerite from a Powerstone perspective, by adding multiple layered arenas with environmental hazards, releasing a new Champion every month, or even drastically increasing the scope of Battlerites, its depth will always be bound to its roster and their abilities. In contrast, Battlerite Royale has widened the scope of play to not only include large diverse locations, but to also add items, armor, merchants, and my personal favorite, bushes to hide in. Although Battlerite Royale feels familiar, there’s no mistaking that Battlerite’s top-down perspective slides into the genres framework with incredible ease. It’s deliciously slick to play, devilishly addictive, and serves to highlight just how good Battlerite’s combat system is. 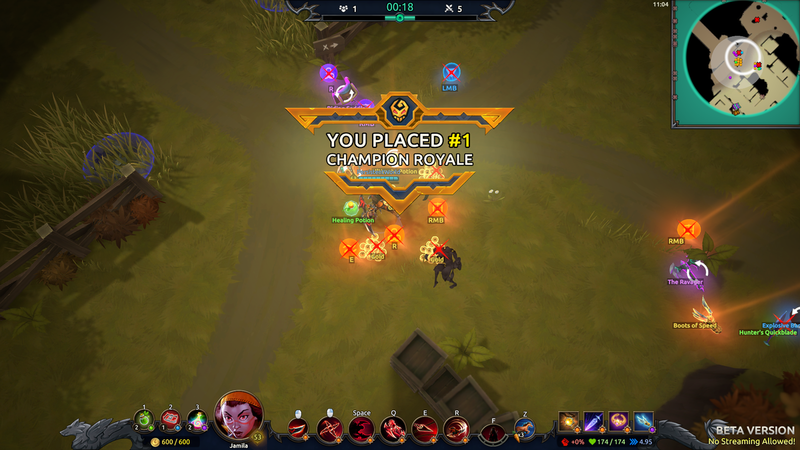 Stunlock’s foray into additional game modes through Battlegrounds might not have gone to plan (honestly, I thought it was good), but there’s no mistaking their intentions with Battlerite Royale. This is a product with a clear vision, that in many ways eclipses Arena. Not only does Battlerite Royale still have the nervy 1 on 1 encounters, group skirmishes and adrenaline packed fights, but there’s greater depth to be found. Here's me on Jamila, encountering a Stunlock Studios developer. You can view the full match here. Such a statement might sound contradictory, especially in light of the fact that Battlerite Royale has heavy doses of RNG (landing spot, loot spawns, which Champions you encounter and when), but there’s no mistaking the breadth of tactics on offer. Considering you get to choose an ability in the lobby, early encounters aren’t necessarily as simple as spamming your primary attack. Clever use of bushes to drink a potion in a pinch, joining a fight late to mop up low health victims, or skirting the edges of the map to avoid the early melee are all valid tactics. There’s also the added layering of a variety of abilities that grant significant utility. Want to block an enemies path? Drop a meteor. Want to hide from a team fight? Pop into a barrel. Want to escape quickly? Transform into a rabbit and zip away. While balancing items will prove challenging, I have to admit that they all feel fair. Not only that, but alongside potions, they add a clever dynamic to combat that softens the blow of removing EX abilities and Battlerites. Considering most EX abilities in Battlerite tended to lean towards sustain or survival, their being missing does feel odd, though its impact is greater on some Champions than others. For example, Iva loses her Tazer and her Flamethrower, but gains the ability to recast her Jet Pack after leaping, while having Concussive Shot on cooldown (rather than requiring Energy). The loss of a Spell Block and subsequent stun, alongside Flamethrower (which was pivotal in her ability to cut through counters) will see her playstyle change significantly. Other Champions such as Rook haven’t seen many changes, but removing EX abilities such as Eat will see him significantly weakened, especially if you also factor in his inability to vault over scenery. Will the removal of Battlerites and EX abilities in favor of items work out? It’s simply too early to tell, but my gut instinct does tell me that it risks diluting kits a little too much, or hamstrings those who rely heavily on them. You could argue that the loss of EX abilities affects all Champions equally, so they’re all in the same boat, yet history suggests that reducing the depth of Champion/Hero kits has never worked out well (look at Heroes of the Storm or Paragon). In fact, and on this topic, I'm curious as to why removing Battlerite’s or EX abilities is even neccesary? There’s plenty of time in the match lobby to adjust and learn EX abilities/Battlerites, and maintaining Champion kits as they are now - to ensure you retain consistency with Battlerite - is surely worthwhile. If Stunlock Studios are seeking to have both games working in tandem, making significant kit changes is likely to alienate those transitioning from one to the other. That’ll achieve the complete opposite of what they want to do: seeing players move freely between the two, without a sense of starting over. Here's me winning my second match. Jamila is set to excel in Battlerite Royale. As for wider thoughts on Battlerite Royale, I think there’s scope here to add a few key additions. The first would be to increase the number of players who can land on the island by 4, just to slightly bump the quantity of encounters and reduce the quiet downtime while looting. On top of that, I think looking at some of Realm Royale’s innovations with their Forge would fit. Rather than simply walking up to the vendor mid-match and purchasing items, why not have him craft them for you, alerting all those nearby as he works his magic? Not only would this provide a focal point for those on the hunt, but it would also create a risk/reward element for those making purchases. Finally, the general ambience of the world needs turning up a notch (let's have a greater emphasis on sound), and I’d love to see a few key changes. Fixed boss camps with unique mechanics that can be killed and looted for rewards. Creatures other than rabbits roaming their respective biomes. Strange inhabitants casting the healing auras, portals and whirlwinds, rather than them simply existing as static effects. Allow players to move while drinking health potions, but reduce the amount they heal by 75%. Implement EX abilities and adjust their utility based on the fact healing potions exist. Allow players to shard items they don’t need for gold, similar to Realm Royale, so that unused items actually have a use. Change the artwork on the vendor. It doesn’t suit the aesthetic of the other concept art/avatar images in the game. I’d also like him to speak/make some sort of sound when you interact with him. Let players sell items back to a vendor in the event they’ve made an incorrect purchase. Remedy Champion movement after the first airdrop to allow you to freely move/twist in the air. Allow us to mouse-over items on the floor (specifically armor) to see what they do/give without having to drop our existing first. Add a more rewarding Champion Royale screen. Perhaps have a unique flag crash land next to your Champion. Add audio and visual effects for when the vortex is decreasing in size. Perhaps a brief screen/ground shake and clear audio cue. I loved every minute of my short time with Battlerite Royale, and there’s no mistaking that it’s bags of fun with masses of potential: I haven’t spoken to a single person who disliked it. That said, many Battlerite fans are right to have reservations about the long-term future of their favorite arena brawler. If Battlerite Royale is a huge success, it could lead to significant improvements for Battlerite and its active players. At the same time, if the spin-off is a success, we could also see Battlerite’s users decrease as players gravitate towards a game-mode that’s likely receive the majority of the studios’ attention. 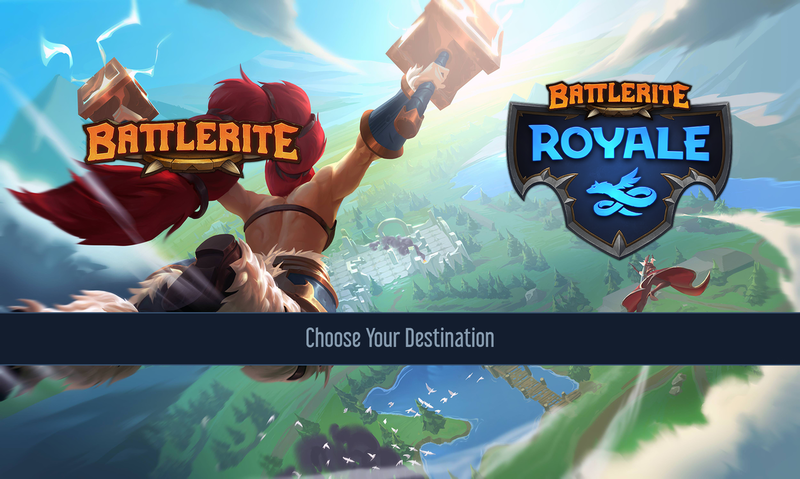 As long as Stunlock find a solution to players accessing both games from within the same client, and at the very least take greater steps to blend key EX abilities/Battlerites into Champion kits, there’s no reason to think that Battlerite Royale will be anything other than an exceptional game. I can't wait to play more, and considering the time its taken for Stunlock Studios to create this spin-off, they deserve commending. You can add Battlerite Royale to your Steam Wishlist now. Its next play-test is Wednesday September 12th, from 18:00 - 20:00 UTC.